Hundreds of jobs were created during the construction of Mthatha magnate Sisa Ngebulana’s smart new hotel, which opens this week. Ngebulana’s Billion Group delivered work and wages to 700 mostly local workers during the construction of the Mayfield Hotel and now 200 people have permanent jobs at the city’s brand new accommodation and entertainment complex. These jobs are in addition to more than 3000 jobs created by the construction of the adjacent Ngebs mall. 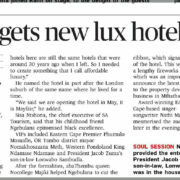 The three-star hotel was launched by the rural-born billionaire on Wednesday night and today it opens its doors to the public. The R130-million, 96-room Mayfair Hotel is part of a bigger property development project planned for Mthatha by the soft-spoken mogul. His first project, the 60000m² BT Ngebs Mall, named after his grandfather, was officially launched in 2015. The Billion Group spent R1.4-billion on the mall. The development is located along the way of the soon-to-be constructed N2 bypass. It is between the Mthatha CBD, Kwezi, Mbuqe and the industrial area, Vulindlela Heights. It is also opposite Mthatha Stadium, which is being given a facelift by the government. Close by will be another major development that will include high-rise apartments overlooking Mthatha and the soon-to-be constructed highway. These are only part of the billionaire’s R16-billion investment plan for the next 10 years in Mthatha, Port Elizabeth and East London. 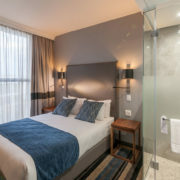 The three-storey hotel boasts a luxurious three-room penthouse suite at R10000 per night and a two-room presidential suite at R5000 per night, as well as two executive suites at R2300, 88 normal suites for R1495 per night and several conferencing halls. Premier Phumulo Masualle, OR Tambo district mayor Nomakhosazana Meth, Tourism SA CEO Sisa Ntshona, Western Mpondoland King Ndamase Ndamase and AbaThembu Queen Nocollege Dalindyebo all agreed during the opening on Wednesday night that the hotel and other projects will give the local economy a major boost. “A modern aesthetic provides a sense of luxury not expected of a standard business hotel. 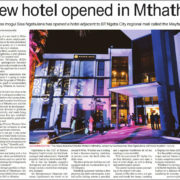 In this way, the Mayfair will punch above its weight and draw in a new diverse customer base,” Ngebulana said, adding that the Mayfair might be a four-star business hotel, but the attention to design and detailing would ensure that guests were “pleasantly” surprised. The good news about the number of job opportunities in the Mthatha area comes amid gloomy unemployment figures released by Stats SA yesterday which showed that the province lost 5000 jobs in the first three months of the year. Unemployment rose from 28.2% in the first three months of last year to 32.2% this year, Stats SA found. 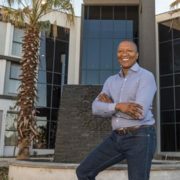 Ngebulana has developed a number of shopping malls in South Africa, including Hemingways and Mdantsane City in BCM, Forest Hill City in Centurion and Baywest City in Port Elizabeth. He said developments around those were afoot. Masualle said the fact that the investments were made by a local person was worth celebrating. 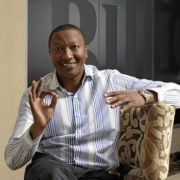 Ntshona said Ngebulana was an inspiration to South Africa. https://mayfairhotel.co.za/wp-content/uploads/2017/07/Mayfair_Hotel_Mthatha.jpg 282 600 mh_admin https://res.cloudinary.com/kemoso/image/upload/v1512698527/Mayfair%20Hotel/horizontal-logo-brown.svg mh_admin2017-06-02 20:14:372017-07-16 20:25:11"Smart Mayfair Hotel creates employment"
"Property mogul opens new three star hotel in Mthatha"
"New hotel opened in Mthatha"
"Mthatha gets new lux hotel"
"Inside Sisa Ngebulana's new luxury hotel in Mthatha"
"Billion Group opens four-star Mthatha hotel"
"Founder of Billion Group builds R130m hotel in Mthatha"